You might have noticed there was a bit of a kerfuffle last week over remarks made by Martin Amis during the first episode of Sebastian Faulks's BBC2 programme Faulks on Fiction. In an aside, Amis said, "When people ask me if I've ever thought of writing a children's book, I say, 'If I had a serious brain injury I might well write a children's book, but otherwise...' The idea of being conscious of who you're directing the story to is anathema to me, because, in my view, fiction is freedom, and any restraints on that are intolerable." He then added, back on the subject of his character John Self from Money: "I would never write about someone that forced me to write at a lower register than what I can write at." Almost a week later – presumably the time it takes these days for reporters to catch up on telly programmes on BBC iPlayer and rouse themselves enough to go and canvas opinion and hopefully whip up a bit of controv, the idle bastards – The Guardian ran a story about the "anger and offence" Amis's remarks had caused, featuring rebuttals from a number of dissenting children's authors. Predictably, shortly after that the twittersphere and blogosphere threw a collective hissy fit and began loudly condemning Amis and all his works, and permutations of the 'story', such as it is, have been running ever since (google "Martin Amis brain injury" – stop sniggering at the back – and you'll see what I mean). A UK hardback first edition/first impression of London Fields, published by Jonathan Cape in 1989. It's in nice condition, and as you can see from the £2.99 price sticker on the back, it cost rather less than you'd ordinarily have to pay for a true first. The only problem is... I can't remember if I've read the bloody thing or not. 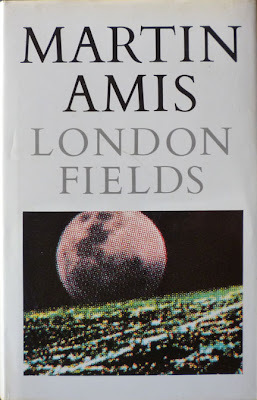 I have read Amis's early novels – The Rachel Papers, Dead Babies, Success, Other People, Money – and flicking through London Fields, parts of it do seem familiar to me. But if I have read it, I can't for the life of me recall a damn thing about it. 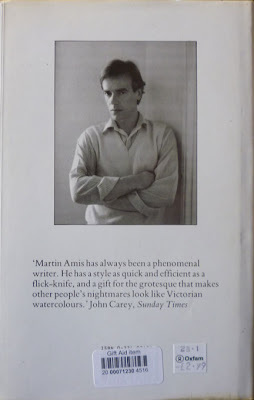 What's more, upon further reflection, I can't recall anything about any of the other Amis M. books I've read either, with the possible exception of Money, and even there it's only a vague and lingering impression of John Self. I'm not sure what conclusions I should draw from this. Is it a case of failing memory? I don't think so, because I can vividly recall many of the other books I read around the same late-'80s/early-'90s period. Is it something to do with the relative strength of Amis's storytelling? Or maybe I merely imagined I read those Amis novels when in fact I did no such thing, a sort of retroactive literary-fying of my admittedly genre-centric reading past (a literary retcon, if you will)? Who the hell knows. I suppose I'll just have to start reading London Fields again and see if anything jogs my memory. And if the book I originally intended to write about today turns up, perhaps in the next post I can make the point I was originally intending to make. Although I'm uncertain now I had much of a point to begin with. Hurm.